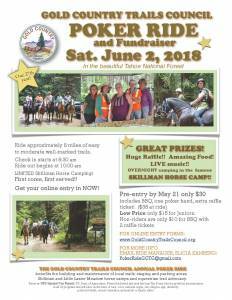 May 29, 2018 – Gold Country Trails Council is an amazing resource for horse people and all others who desire access to non-motorized trails. The organization was founded in 1981 with the main purpose of providing campsites and trails for public use. The Council also provides construction and maintenance of group equestrian campgrounds, construction and maintenance of trails, provides maps and trail educational materials plus allows for group rides in a fun and social way. For more details, including entry forms and flyer please see http://www.goldcountrytrailscouncil.org You can also find membership applications at the main website and or attend a monthly meeting on the 2nd Tuesday evening of each month at the Nevada County Horsemen’s Club House to join.